This will be a long post, but then Alasdair Gray’s Lanark is, like James Joyce’s Ulysses, a very long and exceptionally complex novel. But it’s worth the effort. Gray famously took thirty years to write Lanark; it took me almost as many to finish reading it. I first encountered Lanark in an Oxfordshire village library aged about fourteen or fifteen. How such a self-consciously literary novel ended up there is a mystery, for I found most of the library’s stock to be romantic drivel. Despite my emergent literary taste, Lanark was beyond me. I managed a few chapters, did not have a clue what the novel was about and returned it, doubtless with the usual hefty fines to pay. Somewhere, however, the towering colossus that is Lanark loomed in my consciousness. Every time I thought of what I should next read, Lanark crept up. A hiatus in my visits to Scotland helped, since the novel is rarely seen in bookshops in the south. In Scotland, it has pride of place in displays of modern Scottish literature. At the end of October last year, one windy afternoon in Edinburgh, at five o’clock and as the dusk was already drawing in, shortly before I left Waverley for Kings Cross and home, I succumbed and bought a copy of Lanark. The woman at the till in the George Street branch of Waterstones (a really quite beautiful bookshop) admitted that it was her ‘favourite’ novel. Really, I wish I’d bought my copy in Glasgow, for Lanark is a novel about Glasgow and having some knowledge of the fascinating city is useful. For those who have never been, it’s difficult to imagine a city more different in character from Edinburgh: it is an almost gargantuan city. Its centre is laid out on a grid, rather like many American cities, and its suburbs and industrial areas sprawl for miles around. Poverty, industrialisation, civic pride, appalling health, decline, crumbling Victoriana, tenements… All have left their mark. It was for many years in terminal decline and dogged by ill-fated regeneration schemes, not least in the early Eighties when Lanark was first published. 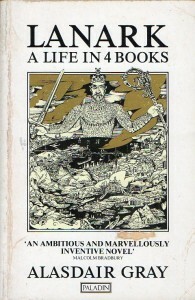 Lanark is subtitled ‘A life in four books’, but it is much more than this; it is really two separate novels which interconnect, comment on each other and provide a prism through which to read the other. Nor are the two novels within a novel arranged chronologically, further complicating the experience of the reader, though both explore love. Nor has Gray made matters easy for the reader, both suggesting that they are connected and suggesting that they are not connected. The first (though not in the order given in Lanark) is the story of Duncan Thaw, a small boy growing up in a mixed district of the city of Glasgow. Here Lanark most resembles a conventional, realist novel. Evacuated to the Highlands during the Second World War, his story echoes a novel such as A Portrait of the Artist as a Young Man, and like Joyce’s bildungsroman draws on Gray’s own adolescence for its material. Thaw passes the entrance test to a grammar school and finally reaches Glasgow School of Art where his increasingly strong sense of individuality clashes with the strictures of his teachers. Thaw’s story, however, is fundamentally a quest for love. Alienated from his more middle class contemporaries, Thaw’s mind rushes, is overwhelmed with lurid, violent fantasies, yet he yearns for tenderness and affection, neither of which he finds. Thaw seeks some kind of meaning or purpose, exploring art and religion, rejecting the well meant but meaningless aspirations of his father, though it is hard not to notice Gray’s self-critical voice in this. It is, moreover, a profoundly moving and tender story, particularly in the tragic early death of Thaw’s mother, and evocative in its creation of a Glasgow of trams, dark nights, abandoned canals, tenement living and the effects of poverty. Thaw’s hell is personal, a story of despair and an inability to connect. Alongside this is the story of Lanark the man which opens and concludes the novel. Perhaps echoing Thaw, Lanark has no identity. He wakes on a train approaching the city of Unthank, sees a picture of Lanark (a town to the south of Glasgow) and names himself after it. Such events (this one opens the whole of the novel) are characteristic of the Unthank story. Unthank is a distorted, highly surreal representation of Glasgow. Lanark – like Thaw – struggles to relate to the society in which he finds himself, and, like Thaw, struggles to find love. The Lanark/ Unthank narrative is an almost Swiftian satire, a polyphonic assortment of science fiction, fairytale, apocalyptic vision, allegory and postmodern pastiche, a sort of modern descent into hell. Gray’s canvas and inspirations are broad: from Hobbes’s Leviathan to Thomas Carlyle and John Bunyan’s The Holy War. At times, Gray’s target is the absurdity of Scottish politics in the post-war period; at other moments, the novel becomes an exercise in literary self-referencing. Yet, in its experimentation with form – its playfulness with genre, its embracing of everything from Paradise Lost to motorway road signs – the novel parallels Joyce’s Ulysses. At one moment, Gray quotes from William Blake’s poem ‘The Clod and the Pebble’; it would not be unrealistic to compare the two, for Gray’s background is as a visual artist, whose own engravings explain, complement and enrich the text. Indeed – from its most absurd flights of fantasy to the intense, semi-autobiographical Thaw narrative – what emerges is an attempt by Gray to somehow capture not only his own story but that of Glasgow. It is a compelling and extraordinary achievement, the sort of novel which seeks to write about, in some distant nod to Victorian ‘condition of England’ novels, the state of Scotland on a scale unseen before. Burns gets a look in, but Gray is not interested in museum piece writing: this is an attempt to represent a modern, urban Scotland – after all, the majority of Scotland’s inhabitants are squeezed into the Central Belt of Glasgow, Edinburgh and the towns in-between. Thirty years on, it seems very much a novel of its era; any representation of Scotland would today see a very different Glasgow, a city with a kind of self-confidence and sense of moving forward entirely absent from the rain-soaked despair of Lanark. Looking back on reading Lanark, however, I am struck again by the sheer breadth of Alasdair Gray’s imaginative vision. This is not an easy read: it’s demanding, exhausting and frustrating, but it is a novel which provokes, challenges, puzzles and amazes.